The Southeastern Conference has been hit hard in the national media and on social media and everywhere else for its less than stellar basketball reputation. To be fair, it’s not completely unwarranted. Ole Miss opened the season with a loss to Charleston Southern. Mississippi State lost to Arkansas State and McNeese State. Missouri boasts a loss to UMKC. Those are bad losses to be sure, but the SEC is definitely not a one-team league, and the NCAA Tournament is a very good time to prove it. Five SEC teams made the NCAA Tournament this season, including undefeated Kentucky, which is a step in the right direction. You have to wonder, though, how much the Wildcats running through the conference without a loss has tarnished the perception of the rest of the league. Close followers of the SEC recognize its depth of talent from top to bottom this year but college basketball success is often defined by how the conference performs in March. Whether you subscribe to that opinion or think it’s bunk, it is important for the SEC to prove its worth on the national stage this weekend. Below we will examine what each team stands to gain during the NCAA Tournament in addition to bolstering the overall perception of the conference. Kentucky: ESPN has made you acutely aware that Kentucky is chasing history, but even though the Wildcats are on the pursuit of perfection, there are still plenty of doubters. Everybody knows haters are gonna hate, but there is really only one way to silence those detractors, and that’s to win. For Kentucky, anything short of a National Championship will bring out a chorus of “I told you sos” from the numerous Twitter trolls who have persistently claimed that Kentucky has benefited from a weak SEC slate. 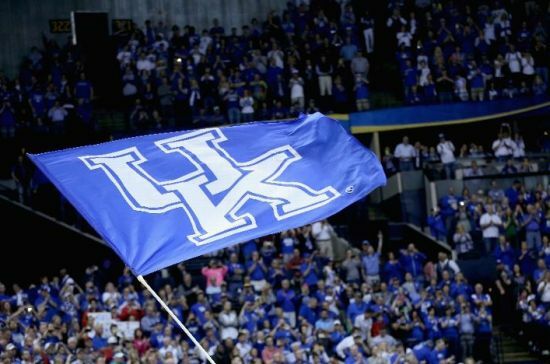 John Calipari‘s club is on a mission to achieve something much more substantial than providing trash talk ammunition for the Big Blue Nation to take on Louisville fans. The 2012 version of the Wildcats may very well have been a better team than this season’s crew, but the Anthony Davis Wildcats can’t claim a 40-0 record. With six more wins the 2015 Kentucky Wildcats will forever be remembered as one of the great teams in college basketball history. Lose, however, and this team might be categorized in the same breath as the 2009-10 John Wall and DeMarcus Cousins Wildcats; a talented team that fell short when it counted the most. For the next six weeks or so, we’ll run down a few weekly superlatives from league play, take a look at how conference teams look in the eyes of the NCAA Tournament selection committee, and anything else that merits discussion. Here is Volume VI, including games from February 3 to February 8. Team of the Week. This week provides several compelling candidates. Kentucky could win this award every time and this week was no exception as the Wildcats handled a quality Georgia team on Tuesday and survived a difficult environment in Gainesville afterward. Arkansas got healthy with two comfortable wins after seemingly scratching by for weeks. Even Vanderbilt tossed its name into the conversation by shaking off a seven-game losing streak and going 2-0. Despite all these worthy choices, Ole Miss gets this week’s nod after notching a big win against red-hot Texas A&M and then following it up with a road win at Auburn (which itself was coming off an impressive win at LSU). The Rebels last week showed that they can win games in different ways. They needed a solid defensive performance to get past the surging Aggies and were especially effective using ball pressure to frustrate Alex Caruso. But it was the Ole Miss offense that showed up against Auburn (57.8% FG, 40.0% 3FG) to negate a great scoring night from Bruce Pearl’s backcourt. The Rebels may not necessarily be peaking right now, but they seem to be rounding into form. Anthony Perez has emerged as a solid wing/post hybrid who can stretch the floor. Dwight Coleby has developed into a reliable rebounding and shot-blocking presence. Those two, along with Sebastian Saiz and MJ Rhett, give Andy Kennedy a solid frontcourt rotation to support his veteran backcourt. 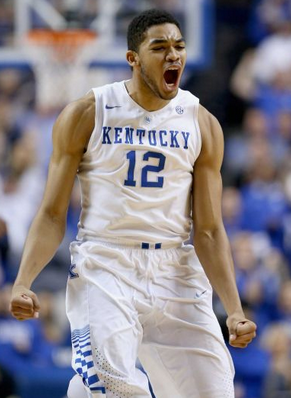 Karl-Anthony Towns had big games in Kentucky’s wins over Georgia and Florida (chron.com). Player of the Week. You can only seek alternatives to Kentucky in this league to a certain point. Karl-Anthony Towns gets the nod after leading the Wildcats to two hard-fought victories over Georgia (KenPom #33) and Florida (#35) last week. The Bulldogs surprisingly outrebounded Kentucky in their game, but Towns stepped up to grab more than half (13) of the Wildcats’ 24 total rebounds. Against the Gators, Towns was only the Wildcat who was able to generate consistent offense at the game’s start, which quietly helped Kentucky stay within contact of the fired-up Gators. Towns’ great week (34 points, 21 rebounds, four blocks, six assists, 10-of-10 FT) is an encouraging sign for John Calipari. The freshman recently went through a four-game stretch where he didn’t score more than seven points or grab more than four rebounds in any single game. Whether it was due to foul trouble, growing pains or some combination of both, it bodes well for the Wildcats that he has now strung together a few great outings. See how Kentucky focused on getting him the ball in this week’s edition of Freeze Frame. Antoine Mason also deserves mention here for cracking 20 points against LSU (24 points) and then following it up with 23 against Ole Miss. Tournament Chatter. Last week’s eight-team pipe dream proved to be too much to handle, and it will be difficult for either of Tennessee or Florida to make a case for inclusion again. But we’ll always have last week. Still, Joe Lunardi’s latest Bracketology contains six SEC teams in the fold, which would double what the league received in the last two seasons. Everyone will certainly take that if it comes to pass. The SEC microsite will preview each of the league teams over the next week, continuing today with Georgia. Strengths. Mark Fox will roll out one of the best backcourt duos in the SEC this season. Charles Mann had a breakout season for the Bulldogs last year and ended up on the all-SEC Second Team. He led the team with 13.9 points per game and posted the 10th best assist rate in the conference (22.7 percent). Fellow junior guard Kenny Gaines was not far behind him at 13.0 points per game and proved reliable from the free throw line (77.7%) and the outside (37.5% 3FG). The problem is that Georgia doesn’t figure to be very deep at the guard position. Fox didn’t bring in any backcourt newcomers, so he’ll rely on J.J. Frazier and Juwan Parker to make similar leaps in their sophomore years like Mann and Gaines did last season. Charles Mann is looking to build on a 2013-14 season that landed him on the all-SEC second team.(msn.foxsports.com). Weaknesses. 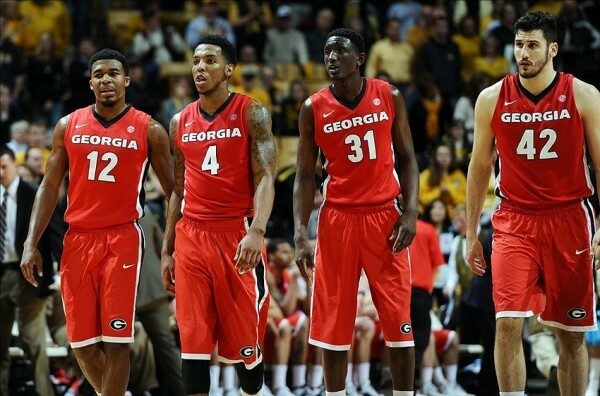 On the intangibles side, the Bulldogs will need to prove that they can play with expectations. They won’t sneak up on anyone and will be playing with the pressure of a team with legitimate NCAA Tournament aspirations. Georgia was unable to build on Fox’s only NCAA Tournament appearance four seasons ago, going just 15-17 the following year. But that team had to replace NBA Draft picks Travis Leslie and Trey Thompkins. This season’s team, on the other hand, returns the bulk of its contributors from last year’s 12-6 SEC finish. The lights will be shining on the Bulldogs this year; can they respond? Toughest Non-Conference Test. The Bulldogs muddled through an uninspiring non-conference schedule at 6-6 last year before their unexpected SEC run to second place. This year, however, the schedule is much more difficult. Georgia faces Kevin Pangos and Gonzaga at the NIT Season Tip-Off on November 26, and that might not even be the toughest game. The Bulldogs also travel to Kansas State to face Marcus Foster and what figures to be a salty Wildcats team on New Year’s Eve. An opening game at Georgia Tech this Friday is also a challenge — Brian Gregory might be on the hot seat but it’s never easy to draw another major conference team right off the bat. SI.com released its SEC preview last week, and it’s worth a read to get ready for the upcoming season (in addition, of course, to all the content on this microsite). The only thing that’s ripe to nitpick is the prediction that Georgia will finish seventh in the conference with an 8-10 league record. It could be that I’m too high on the Bulldogs, but Mark Fox returns the core of a team that went 12-6 and finished tied for third in the SEC last season. Charles Mann and Kenny Gaines are two guards with upside who should be one of the more difficult-to-stop scoring duos in the conference. The Dawgs’ frontcourt may be thin, but Marcus Thornton and Nemanja Djurisic are still quality players, so seeing Georgia fall that far back just doesn’t seem likely. Scrimmage highlights should always be taken with a grain of salt, but it’s hard not to like what Karl-Anthony Towns showed at Big Blue Madness and during a recent scrimmage. His footwork and mobility for a guy that size are impressive, and his versatility could be a great asset for John Calipari and his cramped roster. Towns looks like he’ll be a threat away from the basket in addition to on the low blocks, whether facing up and driving to the rim or knocking down the occasional long jumper. That should allow him to play well with Kentucky‘s rim-centric players like Dakari Johnson and Willie Cauley-Stein without stifling the offense. Marshall Henderson is gone from Oxford and no longer available for our college basketball viewing pleasure, but shocking as it may be, there will be basketball at Ole Miss this season, and as the Associated Press’ David Brandt points out, this may be Andy Kennedy’s deepest team yet. The Rebels return five of their top six players in minutes per game, and they could have the deepest SEC frontcourt in the league outside of Kentucky and LSU. Aaron Jones is a solid senior big man who can clean up the defensive glass, and sophomore Sebastian Saiz (20 points against LSU on January 15) and junior Anthony Perez (21 points against Kentucky on February 22) showed flashes with big offensive nights against strong frontcourts in 2013-14. This is a far cry from the beginning of last season, when Kennedy was trying to replace his two primary big men in Reginald Buckner and Murphy Holloway. Florida freshman guard Chris Chiozza is learning that playing for Billy Donovan is no walk in the park. “Got to run, every play, sprint,” Chiozza told GatorCountry.com. “If you stop sprinting, he’s going to make you run on the side, probably.” Donovan will need his freshmen ready to go this season because he no longer has the luxury of a senior-laden lineup. Junior Devin Walker (knee injury) and freshman Brandone Francis (academically ineligible) are out for the year, leaving Chiozza as the Gators fourth option at guard behind Kasey Hill, Michael Frazier and Eli Carter. It’s likely Chiozza and freshman forward Devin Robinson will be called upon to contribute right away, making every sprint worth it. CBSSports.com’s Matt Norlander has Kentucky’s backcourt ranked as the fourth-best in the country, and it’s hard to find a beef with putting Duke, Arizona and North Carolina above the Wildcats. The development of Andrew and Aaron Harrison will be one of the more compelling SEC storylines this season, after their up-and-down freshmen years were capped off with solid performances (and big shots from Aaron) leading up to appearance in the national championship game. What makes the backcourt even more interesting, as Norlander points out, is the presence of 5’9’’ “passing wizard” Tyler Ulis. He’ll be an absolute change of the pace from the big-bodied Harrisons, and it’ll be fun to see him create looks for the all Kentucky big men. The SEC held its annual media day on Wednesday, going to the home of the SEC Network in Charlotte for the first time. Along with the usual glass-half-full comments from each team’s coach, the media selected its all-conference teams and predicted the order of finish in the league. To the surprise of absolutely no one, Kentucky was not only picked to win the league, but it also dominated the 10-player preseason all-SEC team. While shooting guard Aaron Harrison was the only Wildcat selected on the first team, the second team included four more Wildcats: Willie Cauley-Stein, Karl-Anthony Towns, Andrew Harrison, and Alex Poythress. Aaron Harrison, whose late-game heroics sent the Wildcats past Michigan in the Elite Eight and Wisconsin in the Final Four, was chosen as the Player of the Year. Towns, the only freshman to make the first or second team, is a 6’11” center who most expect to be the best of Kentucky’s latest All-America-filled recruiting class. He was ranked fifth in that class by Rivals.com. Florida, which lost a lot of talent from last season’s Final Four squad, put guard Michael Frazier II on the team, and he was joined by Ole Miss’ Jarvis Summers, LSU’s Jordan Mickey, and Arkansas’ Bobby Portis. The only non-Wildcat on the second team was Georgia guard Charles Mann. It goes without saying that preseason all-conference picks mean next to nothing, but, as always, there were a few surprises. 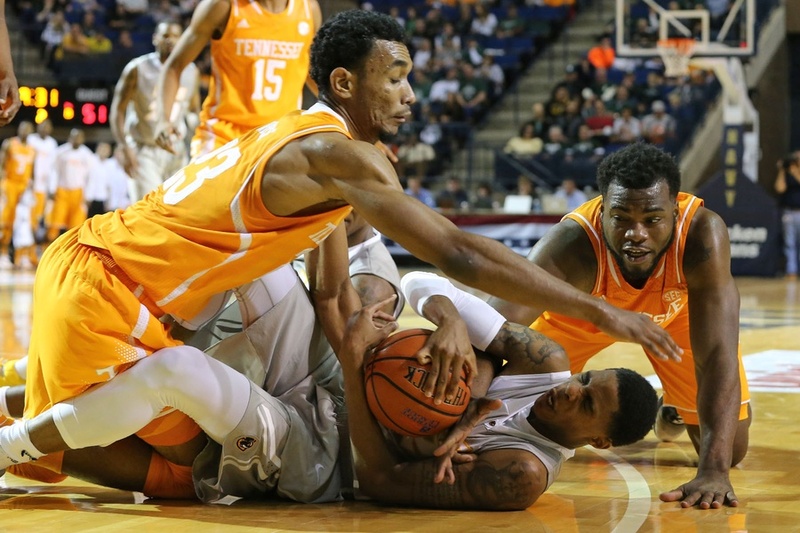 Tennessee’s Josh Richardson, who came on strong during the NCAA Tournament, could have been selected, as he will clearly be the Vols’ best player. Likewise, enigmatic Florida forward Chris Walker, who has already been suspended for the first two regular season games, is primed for a breakout season now that he will be a bigger focus of the Gators’ offense. LSU’s Jarell Martin, who received at least one vote for SEC Player of the Year, was a surprising omission. Certainly coaches are glad to have high-quality players left off of the team, as their perceived snubs will serve to motivate them to prove the media wrong. For Georgia, the “a-ha moment” seemed to come on February 6. After racing out to a surprising 4-1 SEC record (with wins over Missouri and Arkansas), the Bulldogs had lost three straight, punctuated by a loss at cellar-dweller Auburn. That looked like the end of a nice flash of a Georgia storyline. But it wasn’t. Mark Fox’s team has since reeled off four straight wins, underlining this positive streak with a quality win against Ole Miss on Saturday. This begs the question in SEC basketball circles: Is it now time to drop the second part of the “Well, Georgia is off to a good start, but they’re still not that good” sentiment that’s been discussed over the last month and a half? It may be too late to dismiss Georgia’s 8-4 conference record as a fluke (atlallday.com). At some point a sample size gets too big to be simply dismissed. It’s now mid-February and the Bulldogs are four games above 0.500 in SEC play, so we may have reached that point with this team. They haven’t compiled that record by only beating the dregs of the conference — they’ve gone 4-4 against RPI top-100 SEC teams — and they haven’t won those four games with smoke and mirrors either. Georgia has the second best field goal defense (39.4%) and rebounding rate (55.3%) in the league right now, trailing only Florida and Kentucky. This is also a young team led by sophomores Charles Mann and Kenny Gaines who should be gaining confidence. To sum it up, their solid conference play to date doesn’t appear to be a fluke. If you had to describe Mark Fox‘s time at Georgia in one word, “flashes” might be it. The Bulldogs made the NCAA tournament in 2010-11, led by juniors Travis Leslie and Trey Thompkins. But both entered the NBA Draft and Fox was forced into an immediate rebuild instead of entering 2011-12 with two experienced and fringe pro prospects (both players are now out of the league). The next positive jolt in Athens was Kentavious Caldwell-Pope’s SEC Player of the Year campaign last season. But again, Caldwell-Pope bolted for the NBA (this time, smartly), and Fox lost the opportunity to bring back one of the top returning players in the country. Georgia’s surprise 2-0 start in the SEC this year, however, has been keyed by several young players who will almost certainly stick around past April, and Fox could finally be headed to some sustained success in Athens. Charles Mann could be part of an eventual basketball revival in Athens (Getty). Sophomore guards Charles Mann (22 points) and Kenny Gaines (22 points) were essentially a two-man show on Saturday against Alabama, and Georgia was still good enough to beat the Tide (although “getting beaten” has been Alabama’s thing this year). 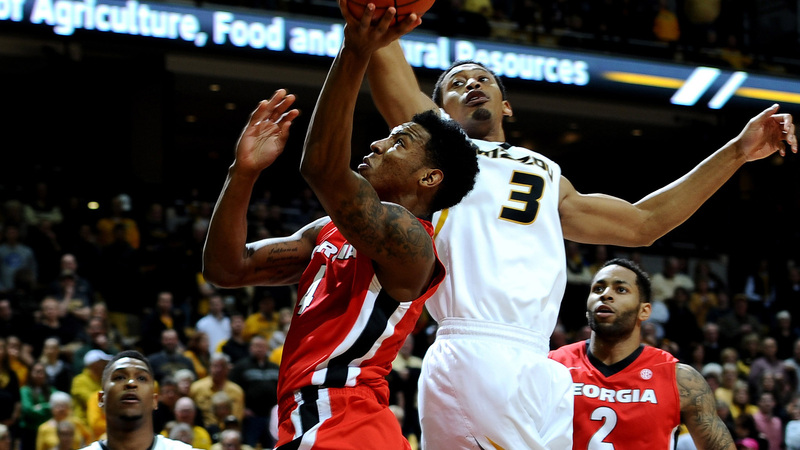 At 6’5” and 6’3′,’ respectively, Mann and Gaines can create the type of big guard mismatches that Missouri has employed this season and were big factors in last week’s road win against the Tigers. They’ve also both shown improvement over last season in several key areas, with Mann turning the ball over less and Gaines increasing his effective field goal percentage. Neither is yet skilled enough t0 make the jump to the NBA, so Fox will actually get to reap the fruits of their development over the next couple of seasons. You can throw forward Brandon Morris into the mix too. The sophomore has the highest PER of Georgia’s regulars and has taken a huge step forward from his freshman year. Versatile junior Nemanja Djurisic, fresh off repeatedly silencing Mizzou Arena, has another year of eligibility remaining too.